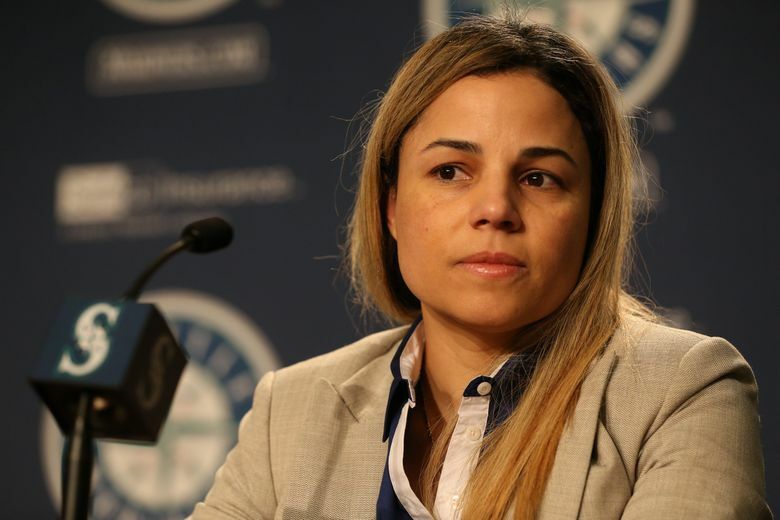 Lorena Martin accused the Mariners of racist and sexist behavior after being fired from her job as the team's director of high performance. After almost three months of investigation by an independent firm, Major League Baseball released a statement of its findings on Wednesday morning regarding the allegations from Lorena Martin that members of the Mariners, specifically general manager Jerry Dipoto, manager Scott Servais and director of player personnel Andy McKay, made racist and sexist comments. The law firm of Epstein Becker Green “did not uncover any credible evidence” that the Mariners or any of its employees violated MLB’s workplace code of conduct. The firm interviewed 17 people, including Martin as part of its investigation. Martin’s accusations against the Mariners first appeared via social media posts on her Twitter and Instagram accounts after news that she had been fired after just one year as the team’s director of high performance became public. She specifically mentioned Dipoto, Servais and McKay in her post. “The Mariners organization has major issues,” the post read. “The things I’ve witnessed and heard first hand have left me shocked. How can their GM Jerry Dipoto, manager Scott Servais and director of player development Andy McKay speak about their players like this. … Calling LATINOS LAZY, DUMB, and STUPID, especially the DOMINICANS. The Mariners immediately denied the allegations. Following standard policy in such situations, MLB immediately launched an investigation into her claims. Martin then filed a wrongful termination lawsuit against the Mariners on Dec. 21. On November 13, 2018, Major League Baseball announced that it would investigate allegations made by Dr. Lorena Martin, a former employee of the Seattle Mariners, regarding her treatment by the organization and her claims that senior Club officials made derogatory and inappropriate comments. The investigation was conducted by Epstein Becker Green, a national law firm specializing in labor and employment matters, whose attorneys interviewed seventeen potential witnesses, including Dr. Martin. The firm did not uncover credible evidence that the Mariners, or any of its employees, violated Major League Baseball’s Workplace Code of Conduct, or applicable anti-discrimination law, in the treatment of Dr. Martin or the termination of her employment. The investigation also concluded that there is no credible evidence to support Dr. Martin’s claim that Mariners’ employees, including Jerry Dipoto, Scott Servais, or Andy McKay, made any of the comments attributed to them in her public statement or subsequent lawsuit. Because of the ongoing litigation, MLB will have no further comment on this matter. Martin was interviewed by Epstein Becker Green lawyer Jennifer Gefsky, former Vice President and Deputy General Counsel of Major League Baseball from 2000-2007. When she worked for MLB, she reported to now-commissioner Rob Manfred, who at the time was MLB’s Executive Vice President, in charge of labor relations for the league. I am aware of the outcome of the MLB investigation. I am disappointed, but not surprised at the outcome. It is unfortunate that when I met with the Former Vice President of General Counsel of MLB, Jennifer Gefsky, as the “independent investigator”, I provided the names of corroborative witnesses who, to my knowledge, have never been contacted. It is also unfortunate that she chose not to speak with any of the Dominican trainers who were fired who could attest to the discriminatory conduct. It is also puzzling why the interviews and information obtained is being kept confidential. I would have hoped for a bit more transparency. More importantly, there were no tapes, no emails, no hard evidence requested nor evaluated other than the questioning of individuals most of whom are still employed by the Mariners. Notwithstanding this decision, I remain confident that the truth will come out and that the damage done to my career will abate. Seattle Times reporter Geoff Baker contributed to this story.